I LOVE decorating for Christmas. I long for a touch of Christmas cheer in every room of the house. The Bear’s room is a special challenge because he is now 18 months old and into EVERYTHING. He can reach to grab things off his shelves and has a special gift for taking things apart. 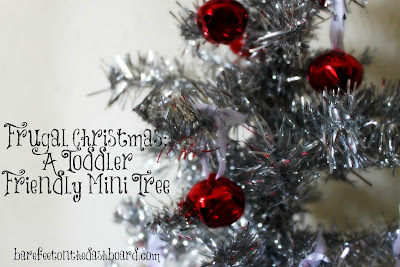 I decided the answer was a toddler friendly mini tree, but my budget was only $5. 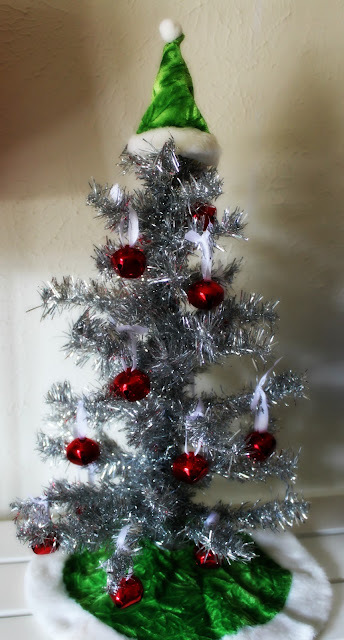 I found this mini tree in the dollar section at Target years ago, along with the hat topper and mini tree skirt. They cost $2 total. 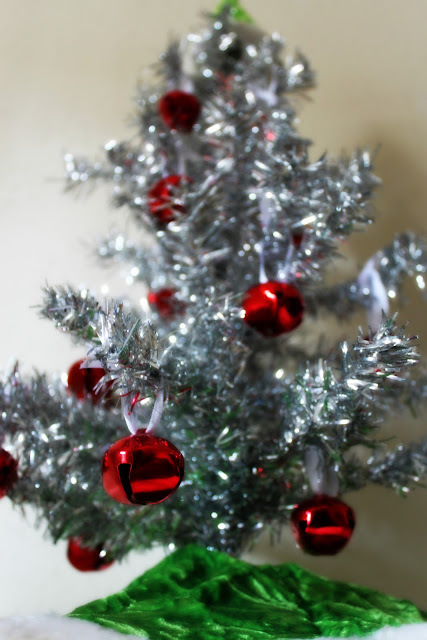 Target has mini tinsel trees right now, and all of their Christmas stuff will go on sale soon if it isn’t already. I looked at mini tree ornaments at Michael’s, Hobby Lobby, and Target, but most of what I found was either breakable or a choking hazard. Yikes. I remembered seeing a fun idea using plastic animals on Young House Love last year, but I couldn’t find the post and got frustrated. After strolling the aisles of Hobby Lobby I came across a big container of large red jingle bells on sale for $3.50. Jingle bells are festive, give a pop of color on my little silver tree, aren’t breakable, and are too big to be a choking hazard. Hooray! 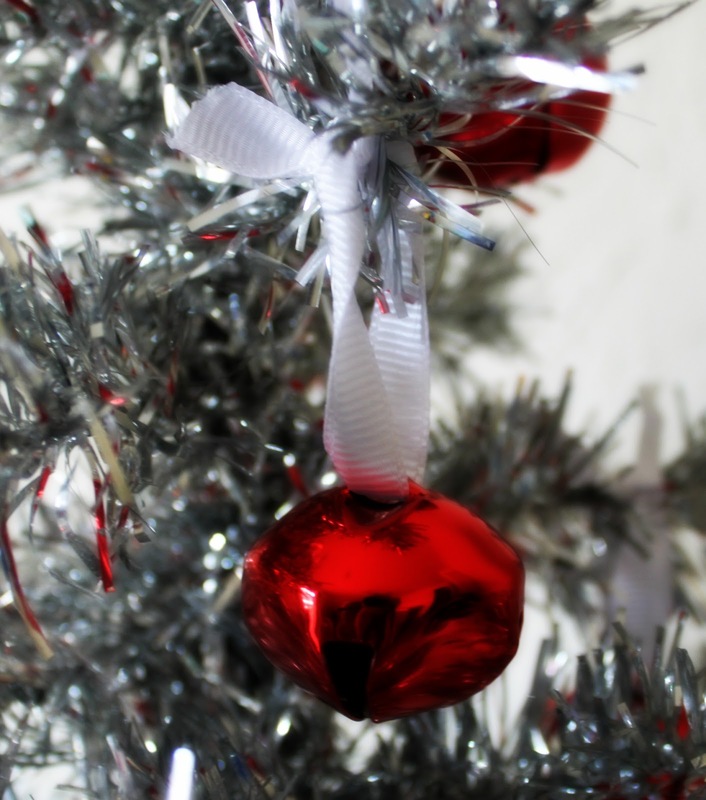 I bought white grosgrain ribbon on sale for $1 and pieces through each bell. The Bear had a fabulous time playing with the bells and was able to help me decorate his tree. Hello, fine motor skill development! 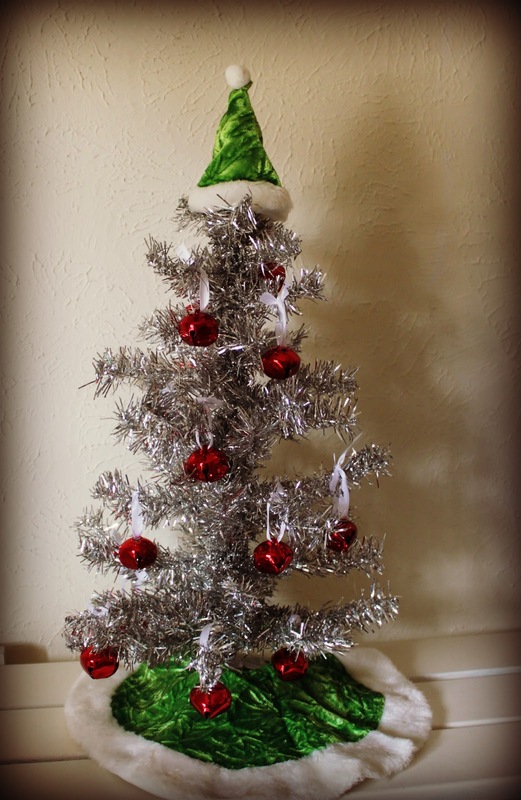 I love the simplicity and festiveness of his tree, and the fact that he can’t break it or hurt himself on it. Let’s call it a Christmas Mini Tree Miracle. Here’s the toddler eye view. Shiny! Do you decorate your kid’s rooms for Christmas? How do you make it kid proof?